Koguryo (37BC ~ 668AD) Because Koguryo was bordered to the north by hostile tribes the kingdom organised a strong warrior corps and these were known as "sonbae". The "sonbae" lived in groups, studied history and literary arts, and were known for their virtue and bravery. The "sonbae" provided Koguryo with a basis for military strength and political leadership. During these early times Taekwondo was known in this area by the name "Subak" and historical records confirm that Subak (Taekwondo) contests were held at various festivals and rituals of the day. The murals on the ceiling of the tomb show two men practicing an early form of Taekwondo and other decorations. Other tombs in the area contain murals with similar images. In the Sambo-chong tomb can be seen a picture of a man wearing a costume similar to today's Taekwondo uniform - loose trousers and a jacket held together with a belt tied around the mid-section - in a stance characteristic of Taekwondo with one hand blocking high and the other low. A mural from a warrior's tomb depicting a scene of kyorugi (sparring). A mural from another tomb depicting a hunting scene. Baekje (18BC ~ 660AD) Historical records such as the "History of the Three Kingdoms" and the "Sui China Chronicles" refer to the various Kings of Baekje patronising the martial arts of Taekwondo and Sirum (a traditional Korean style of wrestling) and sports such as horse-riding and archery. Other records such as folk stories of the time support these records with tales of provincial contests which included early forms of Taekwondo. Shilla (57BC ~ 935AD) At the outset Shilla was the weakest in military terms of the three kingdoms but as Baekje grew in the west, and Koguryo began attacking from the north it became necessary to establish a strong military based on the martial arts. The result was Hwarangdo - a warrior code based on high moral standards similar to the Sonbae of Koguryo. As in other areas of Korea at the time, Hwarangdo contests were often held during festivals. Hwarangdo ultimately became the basis of Shillas' military power thereby enabling Shilla in the 7th century to conquer first the Baekje, and then the Koguryo kingdoms, and ultimately unify the ancient Korean nation in 668AD. The picture shows one of the "Keumgang Yoksa" statues. They are known as the "Keumgang Yoksa" - The Mightiest of Warriors. In Taekwondo training today the Keumgang Poomsae performed by 2nd Dan Black Belts takes its' name from these warriors. It was the Koryo dynasty that ascended after Shilla and again brought unity to the Korean nation. It is after this dynasty that the Black Belt Poomsae "Koryo" is named. During this period the development of the martial art known today as Taekwondo became more systematised and was made a compulsory requirement for selection and training in the military. In fact good skill in the martial arts and success during competitions enabled soldiers to advance their rank. Historical records indicate that the format and judgement of such contests became fairly standardised with elements of sparring (kyorugi) and breaking (kyokpa) competition. Many examples exist in historical documents that tell of impressive feats of skill and strength during such competitions. The kings of Koryo dynasty showed great interest in Taekwondo, encouraging its' development and supporting the contests. Consequently Taekwondo became popular among the general population also. However, as the military became more reliant on gunpowder and new weapons, the support for this early form of Taekwondo subsided and the martial art maintained its' existence through the contests and games held by the general populace between villages and provinces. In addition to the lessening by the military in Taekwondo, or Subak as it was known then, the martial art suffered further loss of support as a result of a change in ideology throughout Korea. Earlier dynasties, particularly Shilla and Koryo, had been heavily influenced with Buddhist philosophies, however the Chosun dynasty was founded on the ideologies of Confucianism. As a result more importance was placed on the literary arts and Taekwondo (Subak) contests at public festivals reduced in number. For some time afterwards Taekwondo and other martial arts enjoyed renewed popularity by both the military and general populace. 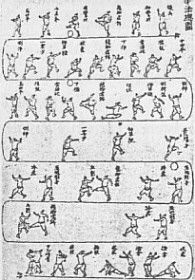 In 1790 King Chongjo commissioned the printing of a martial arts textbook whose 4th chapter entitled "Hand Fighting Techniques" contained illustrations of 38 motions that closely resemble techniques and stances of today's Taekwondo. Illustration from "Hand Fighting Techniques"
The main reason Japan had annexed Korea was to enhance the prosperity of the Japanese people, and in later years serve as a springboard for Japan's invasion of China. In the following years Japanese colonial rule tightened its' grip on the Korean economy and the people. Japanese businesses were given preferential treatment and took advantage of Korea's natural resources. Local Korean customs, particularly the practice and teaching of any form of martial arts were banned although many still practiced Taekwondo in secret. During this period the Japanese took some of the Korean Masters to Japan and made them teach techniques to the Japanese military. In this way a number of Taekwondo techniques were introduced and incorporated into the Japanese martial art of Karate. Later, in 1943, after suppressing Korea's own martial art, the Japanese introduced Karate to Korea and allowed the teaching and practice of this martial art to the Korean people. Because of the suddenness of Korea's liberation from the harsh rule of Japan the people were unprepared for immediate self government. Divisions of ideology existed between pro-democratic and pro-Communist groups. The then Soviet Union invaded Korea from the north and this was followed by U.S. forces landing at Inchon and stationing troops throughout Seoul and the southern half of the peninsula. Thus the country became divided. Many Koreans tried to revitalise interest in the traditional martial art of Subak (Taekwondo) and in 1946 a conference was held to discuss the development of the art and the integration of the various 'kwans' or schools. This unprecedented growth led to the formation of the Kukkiwon as a world headquarters in 1972, and then, in May 1973, the World Taekwondo Federation (WTF) was officially formed with 108 member countries. Since then the WTF has held a World Championships every two years, and regional championships in the Asian, Pan-American, European, African and Oceania regions every alternate year. After appearing as a demonstration sport at the 1988 Olympics in Seoul, and the 1992 Olympics in Barcelona, Taekwondo was accepted as an official Olympic sport in September 1994 and made its' debut as an official sport at the 2000 Olympic Games in Sydney, Australia. Since then Taekwondo has featured in each Olympic Games and proven to a be popular spectator sport. The number of practitioners is increasing steadily and the 'martial sport' element of Taekwondo continues to evolve.